If you have pan drippings, add them into the gravy for a more flavorful gravy. 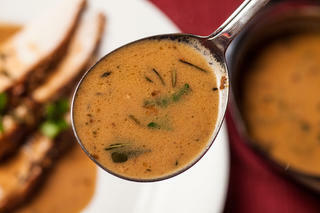 Many times I haven't roasted meat, but still want gravy and this is my easy, go to recipe. If you are gluten free, omit the flour. Melt the butter, add in the broth and heat to a simmer. Add herbs. Mix 3 T cornstarch in a little water. Stir broth while pouring in cornstarch and stir until thickened. Salt and pepper to taste. 2 Cook over medium-low heat and stir constantly to prevent scorching. (High heat will burn a roux, making it grainy and off tasting.) Stir until it turns the color of peanut butter, about 5 to 7 minutes. 3 While whisking continuously, slowly add the stock or broth. Add the fresh herbs. Bring the mixture to a simmer and cook, being sure to whisk at the edges of the pan, until the gravy thickens slightly. Add salt and pepper to taste.